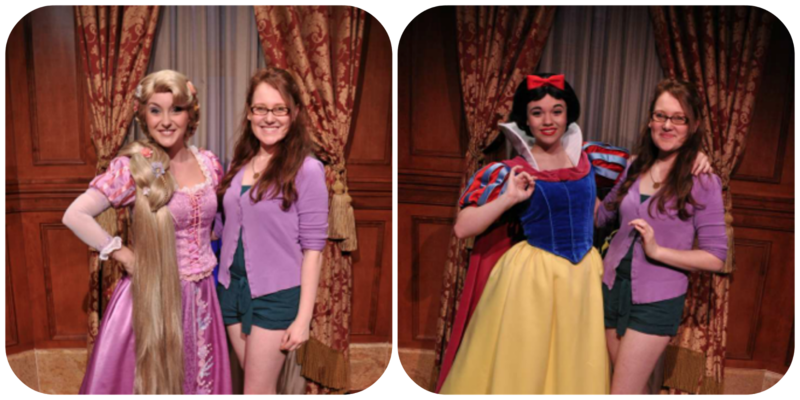 Princesses and Pixie Dust: A Pixie Dust-ed Trip Report: 12/14/13, Part One! 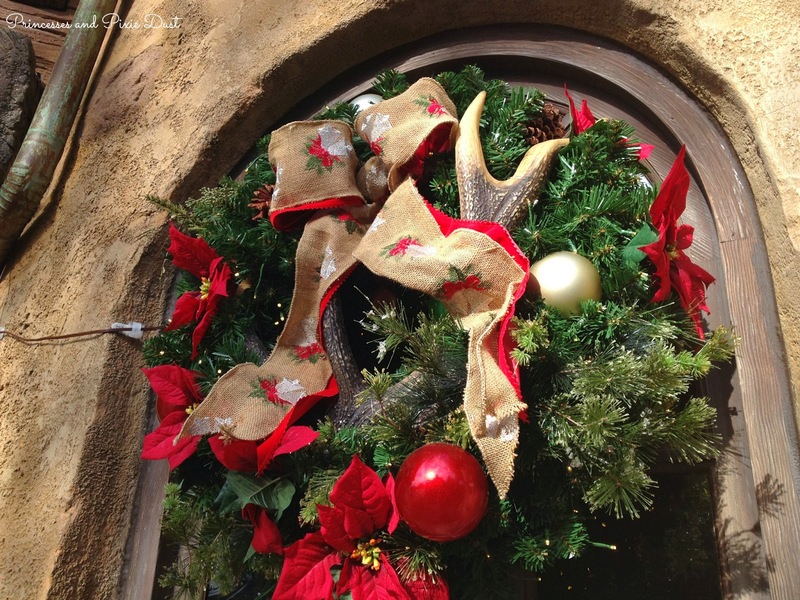 A Pixie Dust-ed Trip Report: 12/14/13, Part One! When it comes to Walt Disney World, I like to refer to myself as a "part-time semi-local", meaning that for about half of the year, I make my home just two hours from the parks in South Florida. (Snowbird? College student.) Luckily this means that, armed with an annual pass and a full tank of gas, I'm able to visit the most magical place on earth as often as my whims demand (so long as those whims present themselves during the appropriate seasons)! They do tend to get get rather antsy, though, which is why I was en route to my beloved kingdom less than 24 hours after I set foot in the Sunshine State this December. Just look at all that holiday cheer! 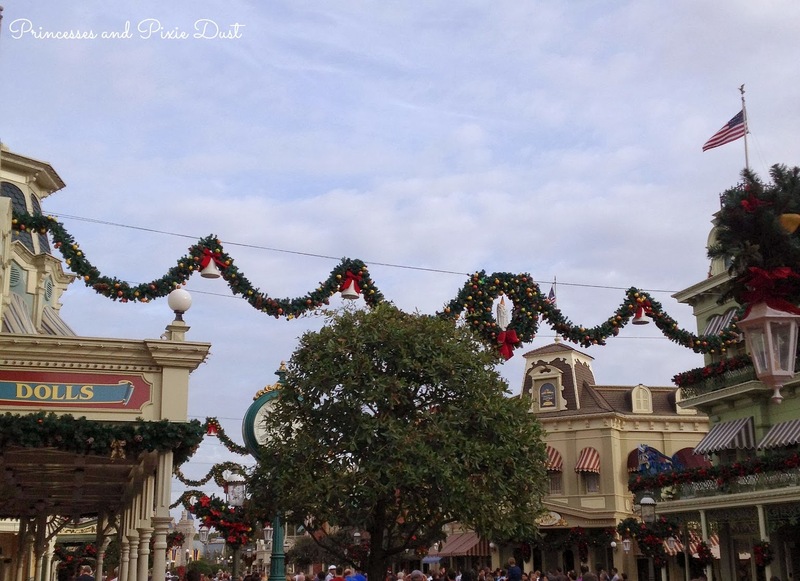 I love the long row of wreaths hanging over the Main Street promenade! They take my breath away every time! After going through the pomp and fanfare of park opening, I passed through the gates to be welcomed by one of the most beautiful sights known to man: Main Street at Christmastime. If I were to stress only one thing, it would be to take a moment and drink everything in; the sights, sounds, and even smells of this idyllic avenue are worth every second spent soaking up the atmosphere. I know the quality leaves a bit to be desired (my camera is decidedly un-fancy... and built into my phone), but check out these amazing portraits! Tiana's is definitely my favorite! Once I had spent a truly excessive amount of time gazing at the enormous evergreen in Town Square, I hurried over to Fantasyland to check out the newly-minted Princess Fairytale Hall. If you haven't paid a visit to this new meet-amd-greet location, get thee to Orlando A.S.A.P. 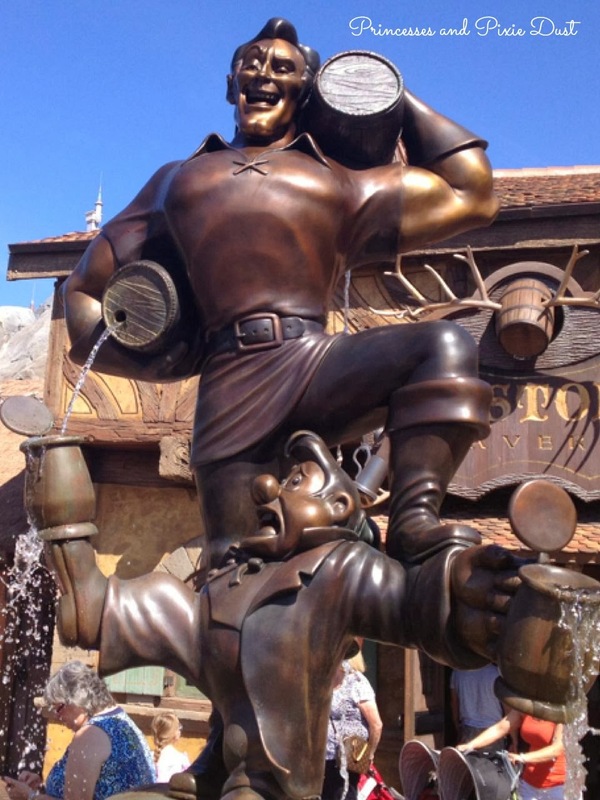 because this penultimate attraction in the New Fantasyland expansion is not to be missed! The princess' new home is truly befitting of its regal inhabitants; the designs of both the indoor queuing area and the greeting chambers themselves are positively stunning. Imagineers spared no attention to detail when creating this opulent royal retreat. Guests may gaze upon the gorgeous portraits that adorn either side of the grand hall before catching a glimpse of a very familiar slipper on the way into the princesses' rooms. Of course, the princesses were perfectly wonderful (per usual). Rapunzel and I chatted about her lovely new abode, while Snow White gushed her excitement over the Dwarfs' nearly-finished mine train. My visit to Princess Fairytale Hall kicked off what turned into a morning-long mixer with my favorite Disney pals (and really, what locale better serves a character-palooza than Fantasyland?)! After rubbing elbows with the aforementioned royals, I kept the princess-y theme going as I dove "under the sea" to hang out with Ariel, then looped back to the castle to find Cinderella's Fairy Godmother (who, incidentally, is too sweet for words). 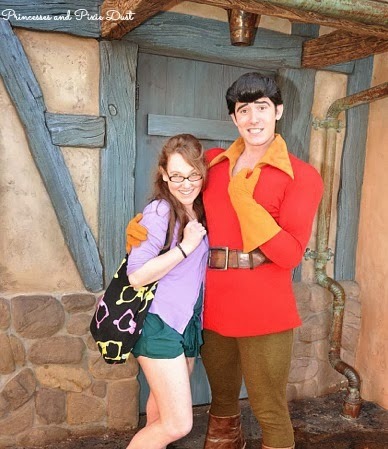 However, the real highlights of the morning came when I was able to catch up with two of my favorite parties: the Tremaines, and the illustrious, the incomparable, the utterly inimitable... Gaston. Anastasia and I declared ourselves best friends just prior to this photo being taken... I don't think her family was too pleased! Princesses are nice and all, but there's nothing like a character that can (and will) set me up with a heaping helping of sass. 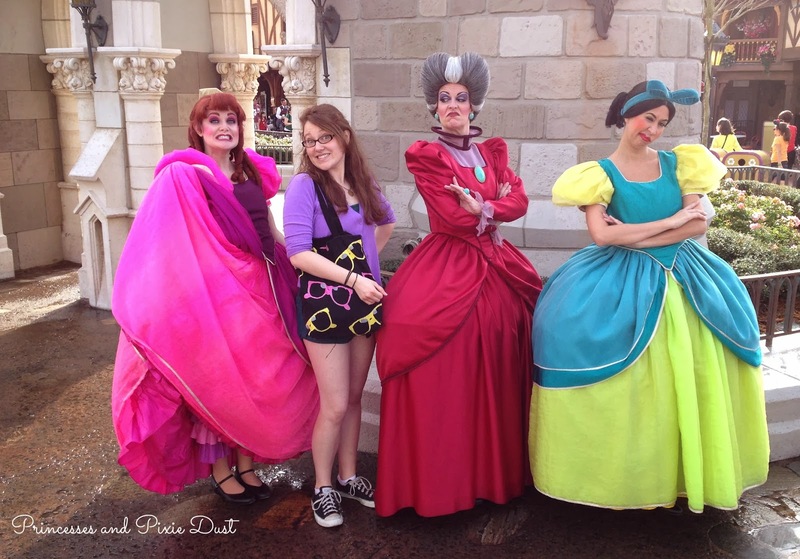 Fortunately, the Tremaine family (consisting of Anastasia, Drizella, and the Lady) are guaranteed to serve up just that. If you haven't yet experienced the gloriousness of these three, believe me- it is not to be missed. No, these ladies will not be telling you "how beautiful you look in those Minnie Mouse ears", and the very mention of that Cinder-somebody's name will get you nothing but some serious side-eye... these are, after all, the kinds of women to hold a grudge. Still, in the case that you're looking to score a few brownie points, flattery will get you everywhere. Yours truly: "So, I noticed the fantastic incorporation of antlers into your Christmas decorations at the Tavern. I love it!" Gaston: "Well, you know, I don't actually use antlers in ALL of my decorating." Gaston: "It's a common misconception; I only use them in half of my decorating. The rest are portraits of me... in antlers." 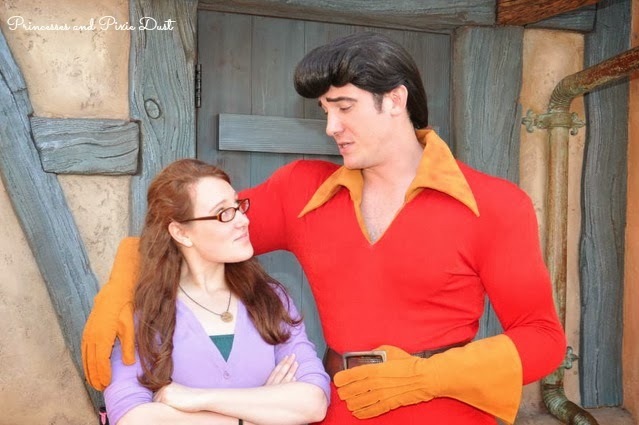 Gaston: "It's alright, you may throw your arms around me! I often do it myself..."
Seriously, how could you not love this guy? 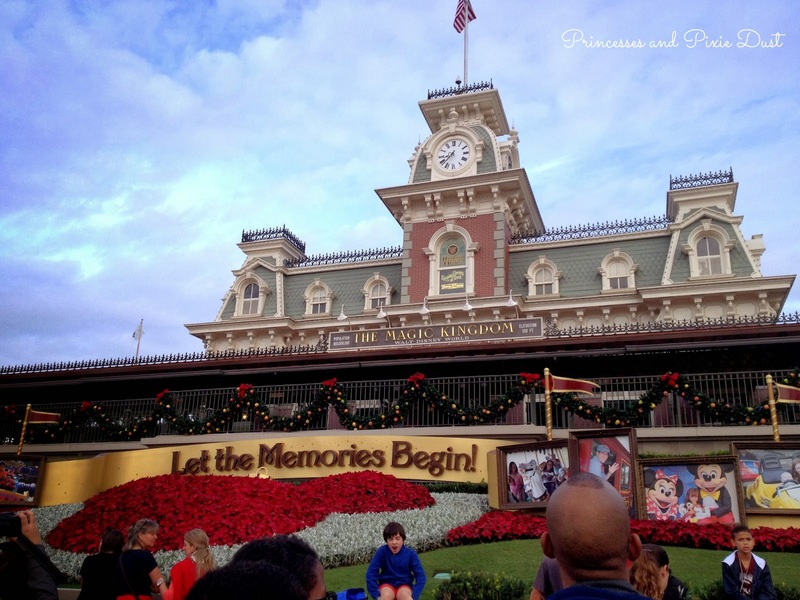 The Road to runDisney: Frozen and the Flu! The Road to runDisney: Running Reads! The Road to runDisney: Back to the Grind!